April 20 is National Pineapple Upside-Down Cake. It's time to enjoy a delightful and delicious masterpiece. It is believed that upside-down cakes became popular in the early 1900s, although the baking technique is likely to be used even earlier. Food historians believe, that first upside-down cakes were developed during the Middle Ages. The classic American pineapple upside-down cake appeared after Jim Dole invented canned pineapples, that are used for the cake. 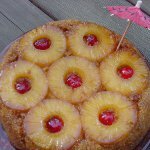 Pineapple upside-down cake became even more popular after the Hawaiian Pineapple company ran an ad campaign in 1926 to show, that canned pineapples could be used in many recipes. The contest was announced and the 100 winning recipes were published in a cookbook the following year. If you want to make an upside-down cake, line the bottom of the pan with slices of canned pineapples. Put a cherry in the center or each pineapple ring, then sprinkle with butter and sugar. Pour cake batter on top of pineapples and bake it. Turn the cake upside-down to serve and reveal your masterpiece.